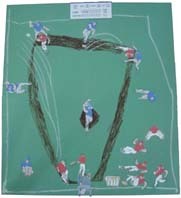 This Paper Baseball Field is a super fun baseball craft for kids! This is easy to make with our printable cut-outs and simple craft supplies. 1. If you are using 6 pieces of construction paper you will first need to tape them all together on the back. 2. Using a brown marker and chalk draw on your bases, lines, pitcher mound, etc..
3 Cut out the players you like the best and arrange them on your field. Don't forget to write out the score on the score board and attach to your field!